Have You Picked Up Your Summer Issue of Cape Ann Magazine? 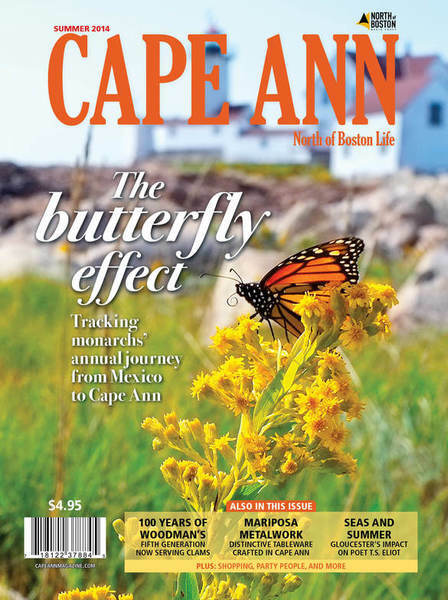 What a terrific issue and the perfect read to bring to the beach (and not just because my story about the Cape Ann to Mexico Monarch connection is featured on the cover!). Cape Ann Magazine’s Summer 2014 issue provides a wonderful window into summer living on our beautiful North Shore. I throughly enjoyed reading all the articles, including Gail McCarthy’s about Essex sculptor Shelly Bradbury and the beautiful work she does designing for Mariposa; Alexandra Pecci’s two articles, one about Mariposa, aptly titled “Elegance for Everday,” and a second interesting story about Woodman’s celebrating their 100th year in business; Andrea Holbrook’s story featuring Gloucester’s only sailmaker Josh Bevins; and Sean Horgan’s article about tuna-chasing Johnny Johnson. Pick up the Summer 2014 issue of Cape Ann Magazine. I guarantee, you won’t be disappointed! 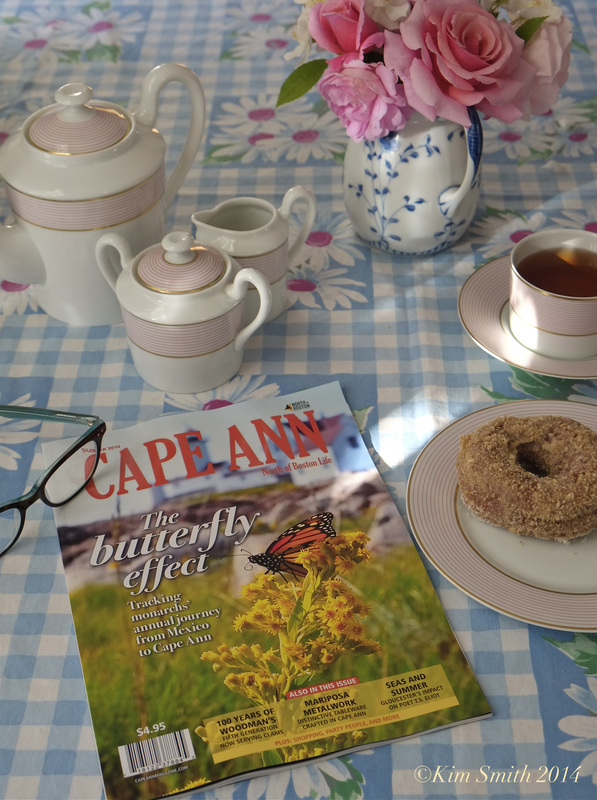 Luxuriating before work with Cape Ann Magazine’s summer issue and Brother’s Brew fab house-made doughnut! Like many communities throughout North America, Cape Ann shares in the interconnected web of the wondrous migration of the monarch butterfly. The very same monarchs that we see nectaring in our gardens and along the shoreline in late summer make a journey of over 2,500 miles south to Mexico to spend the winter in the unique and magnificent oyamel fir and pine tree forests of the Trans-Mexican Volcanic Belt, known locally as the Sierra Nevada (Snowy Mountain Range). Last December, reports began to pour in from Mexican and American scientists that the number of monarchs overwintering was the lowest ever documented, representing a 90% decline from population numbers recorded in the 1990s. This coincided with the lamentably few monarchs seen breeding and feeding in our Cape Ann gardens during the summer of 2013. For the past three years I have been filming the monarchs in Gloucester, and all around Cape Ann, for my forthcoming film, Beauty on the Wing—Life Story of the Monarch Butterfly. I came to the realization that if I did not travel to Mexico at this moment in time, there may never again be the opportunity to film the monarch butterfly migration. This entry was posted in Gloucester Massachusetts, Monarch Butterfly in Crisis, Monarch Butterfly Migration in crisis and tagged Alexandra Pecci, Andrea Holbrook, Cape Ann Magazine, Cape Ann Magazine Summer 2014, Gail McCarthy, Johnny Johnson, Josh Bevins, Kim Smith cover, Livi Cowan, Mariposa, where to buy Cape Ann Magazine, Woodman’s 100th anniversary, Woodmans on June 24, 2014 by Kim Smith.